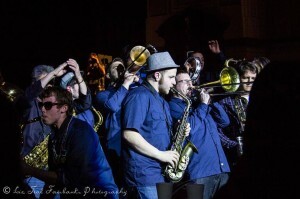 The Party Band have been together only a little over a year, yet they have already made a lasting impression on the Lowell music scene. Not only have they just released their first album ‘Transcendenta’ themselves, but there are also big things in store for them in the future. We asked Seth Bailin, bandleader, about the origins of Party Band and all their work, from after-school sessions to putting on Pure Cosmic Bop, a showcase of some of the best local music. How long has The Party Band been around and how did it start? 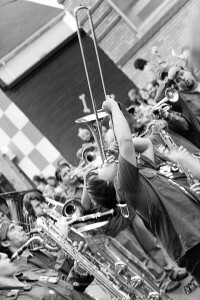 The Party Band started as an idea while at HONK!Fest 2012. I had been going to HONK for a few years before then, and was always amazed by the energy created by a group of people with horns and drums. While dancing to The Pink Puffers (from Italy), I told myself that upon moving back to Lowell for graduate school, I would start a HONK band. Between HONK 2012 and moving back to Lowell, I took a trip to New Orleans, where street music is not only alive, but ingrained into the culture. It was in New Orleans where I soaked up a lot of the style and repertoire associated with street music. 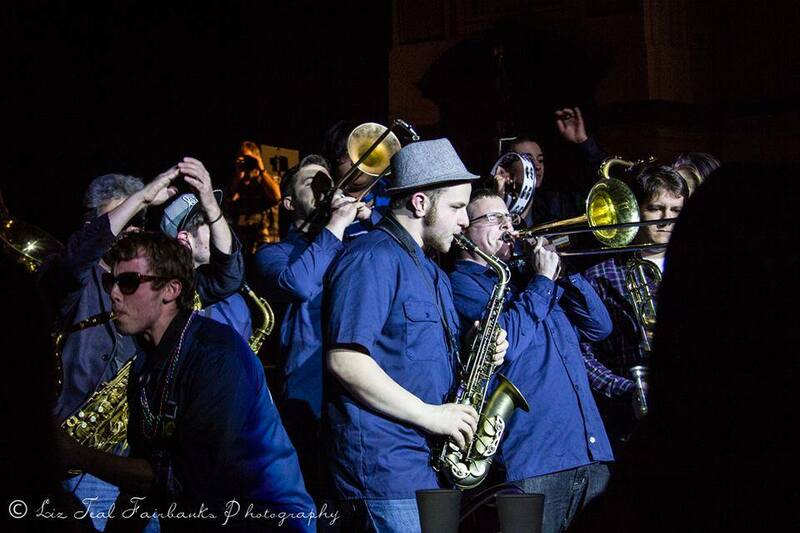 I moved back to Lowell on New Years Day in 2013 with a mission to start a brass band. In the beginning, 5 of us (me plus Mike Kaskiewicz, Kevin Webb, Mike Dettorre, and Devon Hurt) started playing open mic’s in downtown Lowell, and from there we got a gig at Ward Eight for early February. We started having open rehearsals every Sunday, and within two months, we recruited over 10 more musicians, creating a band of 16 people. In May and June we started gigging a lot, adding to our repertoire, and continued welcoming new members. As of now (April 2014), we have been a band for 16 months, have about 25 regular members, and have played over 60 shows, including the street music Mecca that is HONK!Fest. Was it always the plan to play outside whenever possible? We thrive playing outdoors, and would like to do so whenever possible. The magic of The Party Band is that we can turn any location into a stage, any patch of grass a dancefloor. With that said, we have played many great indoor performances: at the Worcester Palladium, the Lowell Memorial Auditorium, Lowell Winterfest, and various Public Schools in Lowell, to name a few. We started playing public schools and after-school programs in May of 2013, and have since visited the Stoklosa, Wang, LeBlanc, Bartlett, and UTEC in Lowell, plus the Wyman school in Burlington, and the Yawkey Boys and Girls Club in Roxbury. These school visits started just as performances, but we are finding new ways to engage the students through interactive singing/writing/dancing activities. We received a grant this year to visit 5 Lowell Public Schools as part of a Music Workshop Tour. We plan to do the tour in the Fall, visit classes of all ages, and introduce/reinforce musical concepts and practices like improvisation, songwriting, ensemble playing, instrumentation, and dance. Your new album Transcendenta just dropped this past week and it sounds incredible! What are the challenges of recording a band this big? Our new album Transcendenta just dropped last week, and has been met with good response. It contains 10 original songs we wrote over the course of one year, and each song features one or two improvising soloists. 23 musicians played live in one room for these recordings. It was challenging for many reasons but ultimately very rewarding. One of the challenges we faced was going for a produced “studio” sound while retaining our wild energy and playing live with so many instruments. Initially the engineers were concerned about “bleed” (the sound of the snare drum being picked up by the saxophone microphone, for example), but after a while the mantra was “embrace the bleed.” It was also a challenge to perform the songs up to our own high standards. Often, after a take, individual members would feel like they nailed the parts, or took an amazing solo, but ultimately we had to keep the takes on which the overall group performance was most solid. While most studio recording projects take advantage of isolation and overdubbing techniques, the Party Band kept this recording as close to a live performance as possible. Tell us about Pure Cosmic Bop and how those parties got started? Last May, I was approached by a local artist Michael Hoerman to put together a jazz night at Gemstones, a club in downtown Lowell. 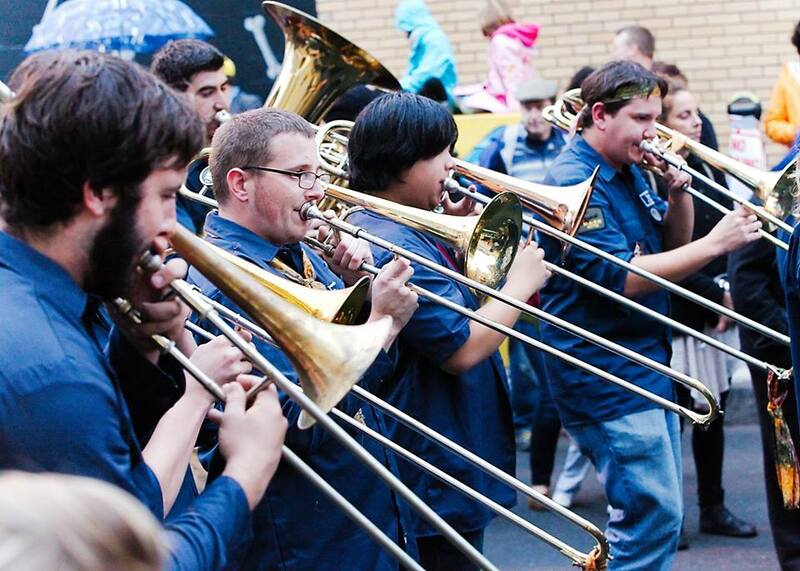 We called that event “Pure Cosmic Bop,” and it featured local jazz groups plus a jam session. It was mildly successful, so we decided to book another Pure Cosmic Bop in July. That one grew, and the third one in November was even more successful than the last two. We decided to align the 4th Pure Cosmic Bop with our album release, and in true Party Band style, make the show enormous in scale. 24 bands performed over the course of 12 hours, and we expanded beyond just jazz music to reggae, folk, experimental, metal, funk, and rock. We are planning to have the 5th Pure Cosmic Bop sometime this summer. Are you guys planning a tour? 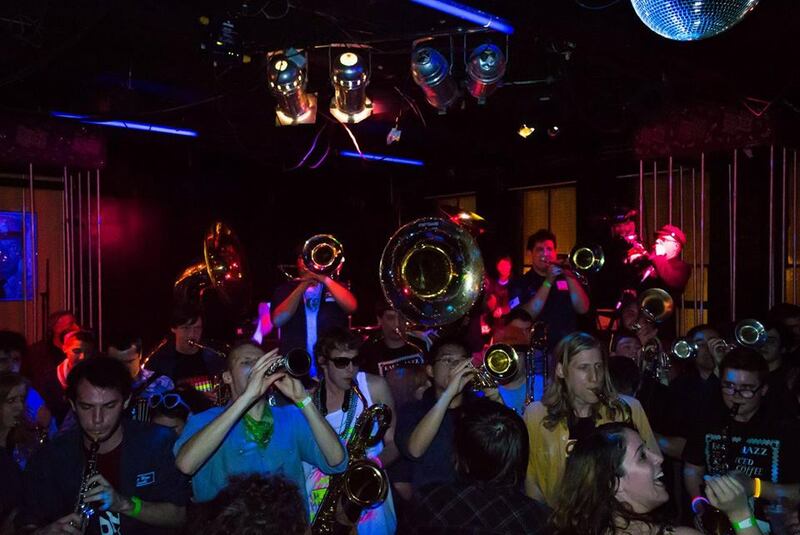 What’s next for Party Band? Two Party Band tours are in the works: one in late June that will take us through NYC to PA for a festival called Madsummer Meltdown, hosted by Jibberjazz Productions, and another 10-day tour in late August that will take us to beautiful destinations along the East Coast. Booking the dates will be easy compared to figuring out how we are going to deal with transportation. Any bus drivers out there want to help out The Party Band??? What’s next for Party Band? Whats next: continue performing our high-energy music, play as many community events and festivals that we can, and work on our 2nd album.